Nothing like coming home to a 58-degree house to inspire one to turn on the oven. Since this week has brought us lows in the 30s, there's been a lot of baking going on at our house. A lot of baking, and roasting, and card-playing, and generally hanging out in the warmest room of the house: the kitchen. This time of year, it's always a battle of willpower to decide when we'll wimp out and turn on the furnace. October 1st is usually the point at which we cave in, but with sunny mid-60s weather on the way this weekend, there's the motivation to stretch our furnace-less time a few more days. Why not? There's plenty of baking to do. And there's nothing nicer than a warm and aromatic kitchen on a raw autumn day. When I came back from a twilight stroll to the garden with a handful of muddy carrots, stepping through the door and into a bright and bread-scented house was divine. A hot mug of tea, quilt-covered knees, and many pieces of warm seedy toast with butter later, the house was a habitable 62 degrees, and I almost relished putting on flannels for bedtime. that all sounds so cozy and wonderful! i wish i could figure out how to transport that feeling into my own home. Sounds wonderful! We've had a little bit of a chill but not quite the temps I love yet. Kristina, I am loving this little series of preparations! The bread looks wondereful! For my preparations, I have been making soup and chocolate cake. Perhaps some bread will be next. I hope you are having a lovely cosy weekend! Lisa-Marie, thanks so much for your kind words! I'm having fun with it, too. I think I've got a few more up my sleeve before I'm done. 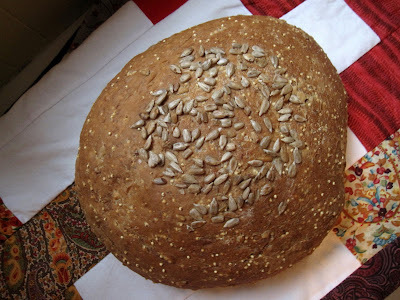 The bread, I have a feeling, with be making a repeat appearance on this blog. It's a winner.